Winter appears to have a death grip on the eastern half of the U.S. for the second year in a row. The thermometer on my car read -6 F on my way into work this morning; with lows of -5, -11, and -2 predicted for the latter half of the week. And to my Northwest friends that have been out mowing their grass already, may the bird of paradise fly up your nose. At this point I don’t even remember what my lawn looks like. Evergreen conifers provide one horticultural escape from the winter blahs. But evergreens don’t have to be green. 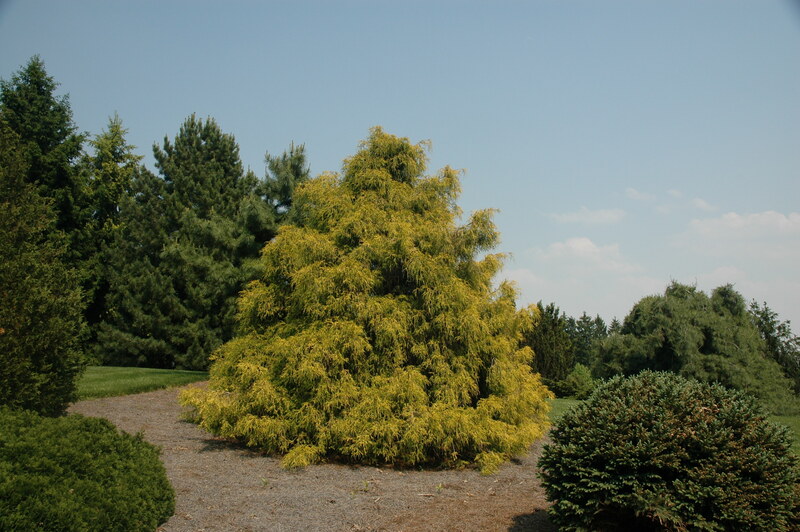 One group of conifers that can brighten up a winter landscape are yellow or golden conifers. I will acknowledge these plants are not for everyone. 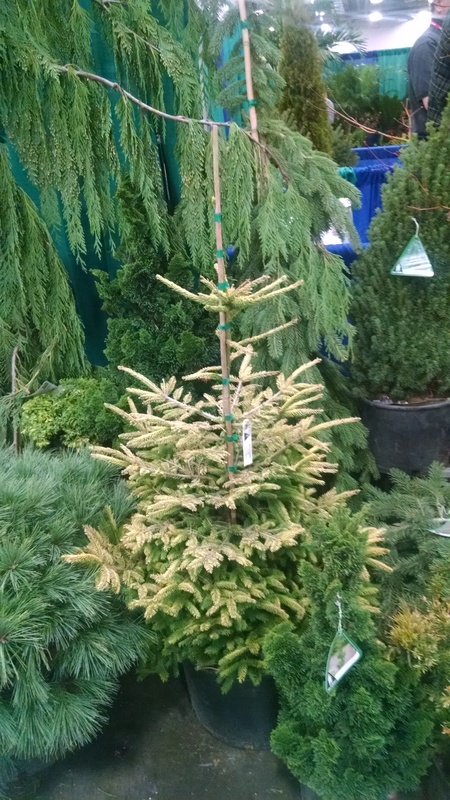 But when sited properly (avoid winter sun is a common admonition among conifer buffs) and used judiciously (a little yellow goes a long ways) these conifers can add a contrasting element that can set off a garden. Note: Hardiness zone and size based on the American Conifers Society Conifer database. Picea orientalis ‘Skylands’ (Skylands Oriental spruce) Zone 4. Size: Large (> 12” per year). This tree is a guaranteed show stopper. The combination of the narrow upright form and golden needles is tough to beat. Picea orientalis ‘Firefly’ (Firefly Oriental spruce) Zone 4. Size: Intermediate (6’-12” per year). Firefly was selected as a sport off of ‘Skylands’ and is a recent introduction from Iseli nursery. So if you like Skylands but don’t have room for large conifer, this could be for you. Chamaecyparis pisifera ‘Filifera Aurea’ (Golden thread false cypress) Zone 5. Size: Intermediate (6”-12” per year). This a tough plant that can make a good contrast specimen or can also serve as a foundation plant. Picea pungens ‘Lutea’ (Golden Colorado spruce) Zone 4. Who says blue spruce have to be blue? Lots of concerns with blue spruce in the Midwest these days (more on that in later posts), but if you’re in an area where blue spruce are still doing well, this is an option for a winter bright spot. Pinus contorta ‘Taylor’s sunburst’ (Taylor’s sunburst lodgepole pine) Zone 3. Ok, I’m cheating a bit here – the yellow comes on the new growth in the spring and then turns green. ACS database lists as a large conifer but I think they are referring to the straight species. When I have seen this plant it’s more in the intermediate range (6” – 12” per year). Curious – why avoid winter sun? ‘Avoid winter sun’ basically means planting in a protected place. Many yellow forms of conifers are prone to winter desiccation. I’ve seen the ones I’ve listed here do well in fairly exposed locations but if you follow the link in the second paragraph to Joseph’s article, you’ll see some demand more protection. Oh, love the golden “blue” spruce! Thanks. I wish I had more room. Curious about the ailing spruces in Midwest and hoping it doesn’t move East. 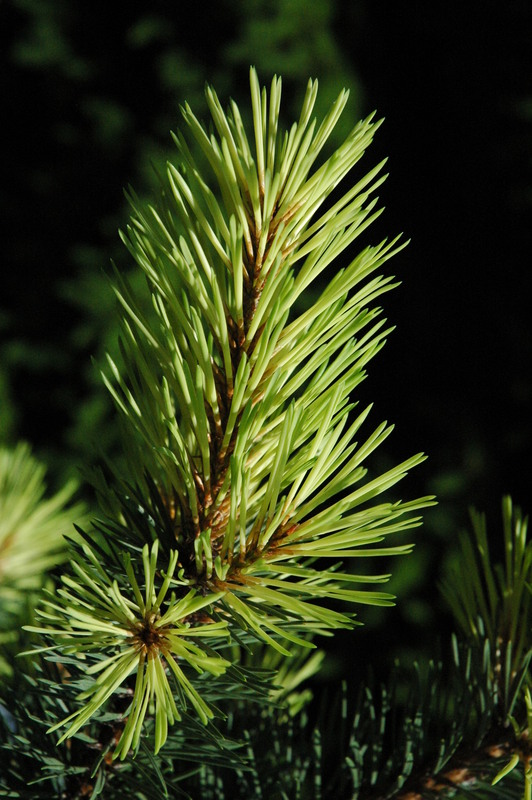 We have series of issues going on with spruce – mostly fungal pathogens. Some colleagues and I are working on a fact sheet. I am planning in a post when it’s ready in the next couple weeks so stay tuned. 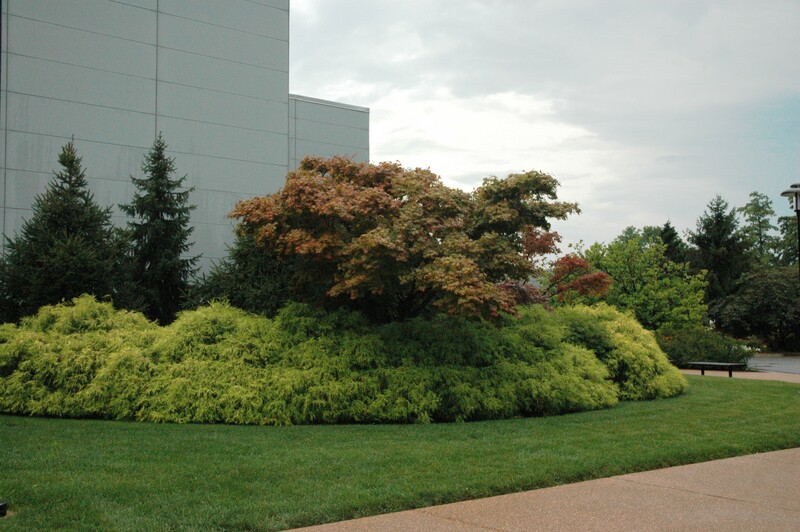 A few days ago I saw an article of conifers on Houzz that featured beautiful photos of conifers in gardens. Unfortunately, most photos showed plants that will grow far too large for the space they were given. From my observation, I believe that the most misused plant in landscapes is the goldthread cypress. I hear reports that one cultivar or another grows only to four feet tall and wide, but that’s not been my experience. Too many people, including landscape architects and designers, think of conifers as cute dwarfs. Ten years later the dwarf must be cut out when it obstructs the front walk. Dave, the growth rate issue is a valid point. Plants grow. It’s one of the joys and challenges of gardening. As I noted, the growth rate on Chamaecyparis pisifera ‘Filifera Aurea’ is classified as Intermediate (6″-12″per year). For globe or mounding forms, this refers to growth in any direction. The plant in the photo is about 30 years old; it’s around 20′ tall and just as wide. So if you’re in it for the long haul, this plant will need some space. 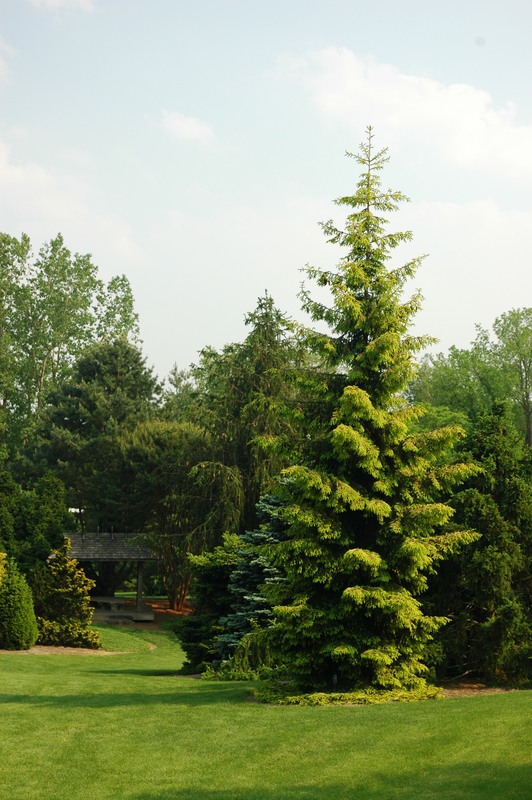 There is a dwarf form (Chamaecyparis pisifera ‘Filifera Aurea Nana’) that will grow less than 6″ per year. About ten years ago I spent a considerable amount if time reviewing documented sizes of coniferous evergreens complied by a number of arboreta across the northern U.S.. I combined that information with observations and measurements I had made over many years during visits to other arboreta, botanical gardens, client’s properties, etc. The results of that effort can be found at . Once there, if you click on the “Falsecypress” link, you’ll see a picture of me (I’m six feet tall) standing next to a twenty year-old (at the time) Chamaecyparis pisifera ‘Filifera Aurea Nana’ at the Bickelhaupt Arboretum in Clinton, Iowa. I think you’ll agree that it’s not exactly a “dwarf” plant! The link referred to in the post above is http://www.tlehcs.com/Special%20Topics/Overgrown%20evergreens/overgrown%20evergreen%20intro.htm. Thanks for the comment. Plants not matching growth rates can be an issue. I had a couple of students do survey of the Harper conifer collection here in south central Michigan. We found about half of the miniatures were growing faster than their ACS size class designation (i.e., more than 1″/year), and about 20% of the dwarfs were growing more than their size class designation (i.e, more than 6″ per year). Another issue is mis-labeling, which is always a concern in the nursery trade. Lastly, given enough time, even dwarfs get big. I have a photo of a 30′ tall dwarf white pine at the Morton arboretum – but it’s 70+ years old! About 20 years ago I bought a beautiful Chamaecyparis pisifera ‘Golden Mop’ and planted it where a 4-6′ tall shrub would be ideal. When it finally reached nearly 20′ tall we had to take it out. I’ve been told that it might have been grown from a cutting that was predisposed to grow vertically or that it might have been mislabeled. Now I’m reluctant to buy supposedly “dwarf” evergreens. And it’s somewhat hard to find good ones that thrive in our Zone 7b climate. Broadleaf ones like rhodies do well, but needle leaf shrubs are another matter. Any recommendations? The plants I’m most familiar with are zone 5 and colder, plus I’d need to know more about your site. A couple of suggestions. 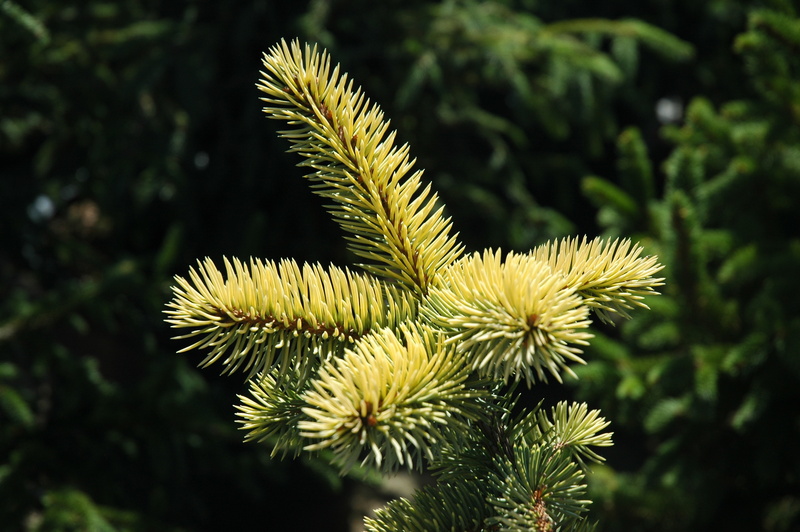 The American Conifer Society database has a search feature that enables you to select plants based on zone and other attributes http://conifersociety.org/conifers/ One thing to bear in mind when using the database is that it is very comprehensive and includes common plants as well as some that are relatively rare and may not be widely available in nurseries. Look for plants where the ACS record includes some photos – those are usually the more common types. Tom Cox and John Ruter recently published “Landscaping with Conifers and Ginkgo for the Southeast ” It is available on Amazon and should cover many conifers for your zone. Bert, do you have an official extension email I could send something to ? I tried posting something we discussed some time back but when I pushed the “Post Comment” button it disappeared. You are welcome to send a note to my regular e-mail: cregg@msu.edu You might also try re-posting your comment under the particular post. All comments on the blog have to be approved. We get a fair number of spam posts, which we delete. One of the administrators may have inadvertently deleted your post. We’ll keep an eye out for it this time and make sure it gets approved. Bert and Kevin, I just checked and there are at least three comments that Kevin has posted. I can’t find any in the trash folder or spam. Can you tell me which post it was? A while back we were discussing fire ecology of Pinus canariensis which is incredible for a pine to spring back after being completely obliterated by fire from outward appearances. Anyway I wrote a lengthy post after my last visit and photographs last month. But I’ll post it to his email anyway. 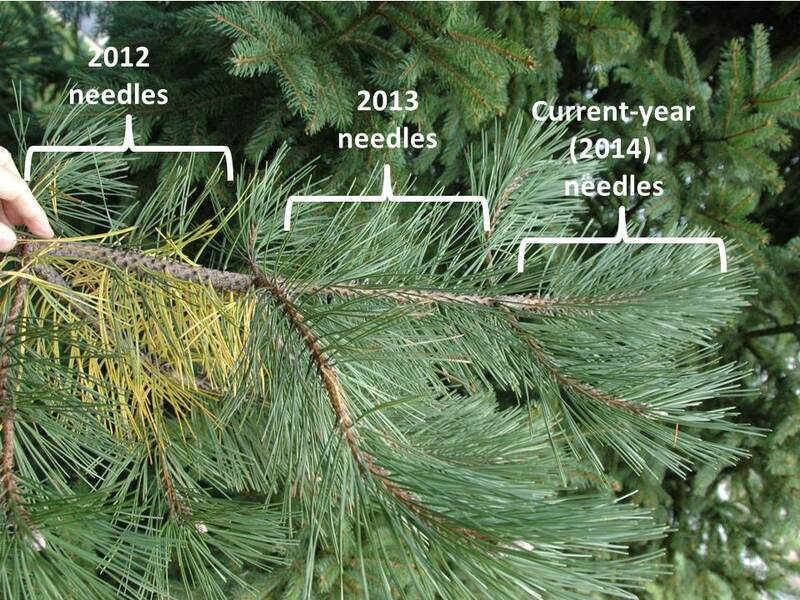 In most of my wild remote out plantings and urban landscapes where I have established pines in community plantings which specific chaparral species interconnected through mycorrhizal networks, I have most trees keeping needles on average 5 years, but sometimes six or seven years depending on the available moisture. Through the present drought in SoCal, the trees within healthy Redshank or Ribbonwood are five whorls with green lush needles in the wild. Redshank is the best at hydraulic lift and redistribution. Surprisingly, Chamise or Greasewood is second. Small correction that ‘Firefly’ is a seedling selection from a ‘Skylands’ mother plant, not a sport. When I talked to my contact at Iseli, he said it was selected from ‘Skylands’. I presumed he meant sport. Thanks’s for the correction!